Destiny Deacon is an Indigenous artist, writer, video-maker, broadcaster and performer whose sense of ‘Blak’ humour is liberally applied to her ongoing commentary on race relations in Australia. Invited to follow the yellow brick road into Destiny Deacon’s 'Oz' we quickly discover that the roads aren’t paved with gold but made from yellow plastic. A reminder that things aren’t always what they appear, nor what we have been led to believe; that history is written much like a story. Deacon uses the fantastical story ‘The wizard of Oz’ as a point of departure for her re-presentation of Aboriginal identity and culture. Deceptively simple, Deacon’s work acknowledges the fictionalising of history, identity and nationhood in Australia’s past. Through her tableaux of assembled Koori kitsch dolls, performing in-character the roles handed to them, Deacon demonstrates in ‘Oz games’ and ‘Under the spell of the poppies’ how the construction of identity is an old game and one that she can play too. One of three larger works from ‘Oz’, ‘Under the spell of the poppies’ stands apart from the 12 smaller images of athletic races and character portraits that comprise the group. Less concerned with sporting farces and puns on running races (the series was made in the lead up to the 2000 Olympic Games in Sydney), this image is a more complex and acute commentary on Aboriginal stereotypes and contemporary urban life, but presented with the same subversive innocence. 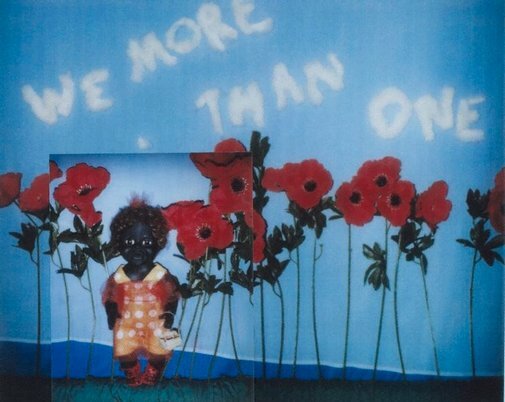 A row of red poppies surrounds her cast of toys and a black doll gathered around a sleeping Dorothy. Knowing the artist’s love of word play, could this be Deacon offering her own peculiar version of ‘Dreamtime’? As Dorothy lies ‘under the spell of poppies’ several associations are made. That of opiates and that of remembrance. Whether this work is a comment on stereotypes of drug use in Indigenous communities, on drug abuse, or a cunning inference of sedation – as an act of violence perpetrated by colonisers or as a necessary means of survival – the distinctions are blurred. Dorothy may sleep to forget, seemingly unaware of the axe that hovers near her, but Deacon shows us that she’ll always remember the past. Signed and dated l.r. sheet, pencil "Destiny '98".